My little friend, Zaza, is completely enthralled with horses right now, as many eight-year-old girls are. 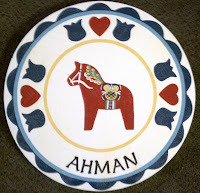 Any picture, book or likeness of a horse catches her eye and so I wondered if she had ever seen a Dala horse. She had not and her curiosity was piqued and so I have researched their history so that I might better answer her questions. Since my Swedish friend, Inga Marta, has a Dala horse plaque on her front door, I thought she might be a good starting point in my quest. According to Inga, as early as 1700, Swedish lumberjacks in the Province of Dalarna near the villages of Mora, Vattnas, Risa, Bergkarlas and Nusnäs would sit around the fire when away from their families after long day of tree-felling and log transport and carve wooden toys for their children. They cared a variety of animals, but the most favored was the horse. The horse was regarded as a creature of great value and strength to a family; a faithful friend that helped move lumber from the forest, worked the fields and helped carry equipment up to summer pastures and chalets. The horse helped in trips to the mill, village and church. Children delighted in their strength and company. These stocky, tailless horses become a well-established tradition. They were unpainted and had just the natural grain of the wood for ornamentation. In further research I learned that in the winter of 1716, while war was waged throughout most of Europe, many soldiers were housed in private homes in the Mora area of Sweden. Due to the severe winter and the war, soldiers and civilians alike suffered from lack of food and warmth. 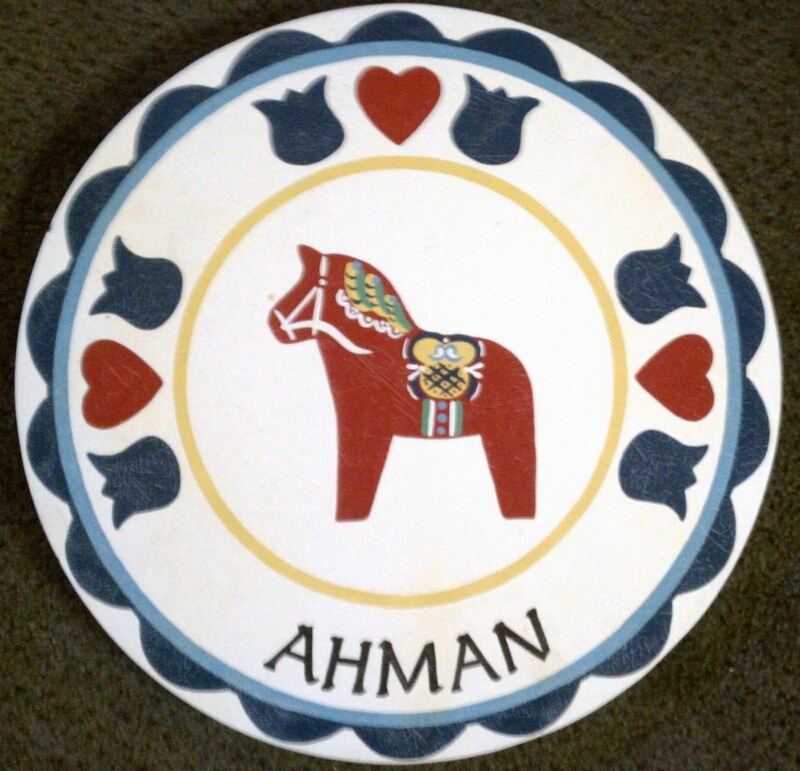 Lore has it that one such soldier, carved a Dala Horse from some scrap wood in the home where he was staying. Before presenting it to the child of the home as a gift, he painted it a bright red, readily from the copper mine of Falun. He decorated the horse with a decorative harness and saddle. This style is known as Kurbits painting and grew more popular in Sweden between 1780 and 1870. The woman of the house gave the soldier a warm bowl of soup in exchange for this delightful toy, and so a system of bartering emerged. Like-minded soldiers began carving and painting horses in exchange for food as well. 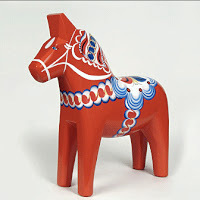 Before long the Dala Horse was credited in part with the army's surviving the harsh winter; this is another reason why the Dala horse is now synonymous with goodwill and has become a symbol of Swedish frugality and dexterity. Dala Horses were traditionally made during the long fall and winter evening hours when little other work might be done. The traditional color of Dala Horses is a bright orange-red, but they are also to be found in natural wood, or painted white, blue, or black, all with ornate Kurbits-style trim. 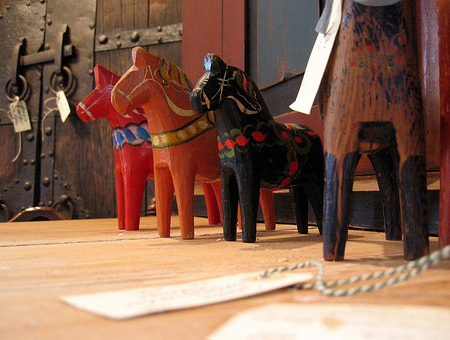 Today the village of Nusnäs, in Dalarna, is considered the home of the authentic Swedish Dala Horses. 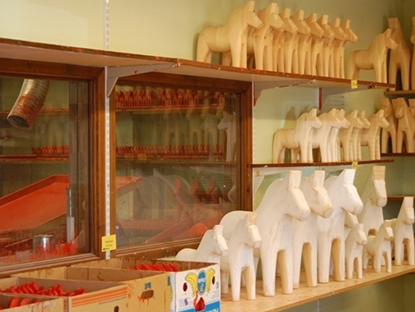 Over 250,000 Dala Horses are produced there every year. These horses also have distinctive shapes and often come in different sizes. Some horses like the Nusnäs horse are stocky work-horses; others are lean and upright with stately countenance like the Rättvik horse. These decorative carvings are a labor of love. Most are made of pine and the initial shape is sawed by machine and then past on to the craftsmen to finish carving. The horses are dipped in primer immediately after the craftsman’s carving, to reveal any defects in the wood that may need to be fixed. Any remaining cavities in the wood are filled in to ensure extra smoothness. They are then dried several weeks to prevent the horses from splitting after they are painted. After a final sanding, the horses are dipped into the paint of the appropriate color and then the craftsman free-hands the ornate paint of the harness and bridle. The art of “rippling” or Kurbits painting requires great skill and takes many years to master. 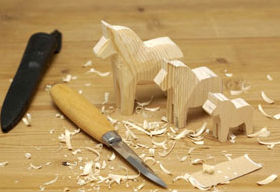 Each craftsman’s develops their own individual technique and many prefer to decorate horses of the certain size over another. That is why the horses are varying in size and no two horses are ever exactly identical.